Last Friday, my colleagues and I decided to go out of our office area for lunch. 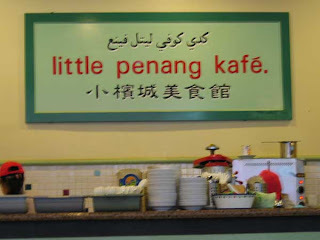 We went to Little Penang Café at The Curve because Dan wanted to eat there (Dan’s very spoilt… :P). 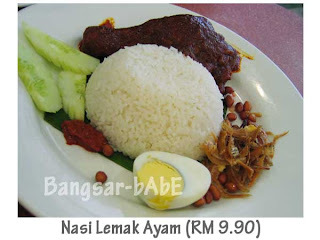 Dan & Roy ordered the Nasi Lemak Ayam while Shum had the 5-Spice Chicken Set (Sorry…no pic. Shum dug in before I could whip out my camera…teehee). 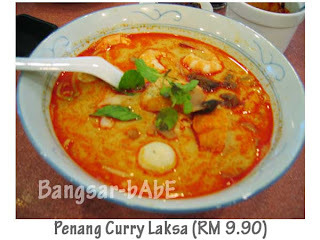 I ordered the Penang Curry Laksa and a bowl of cendol. My curry laksa (I opted for kuay teow) was not bad. The curry broth was thick yet not cloying and spicy with a hint of sweetness from the coconut milk. The noodles came topped with cockles, fish balls, prawns, tau fu pok and garnished with mint leaves. I found the portion quite small. 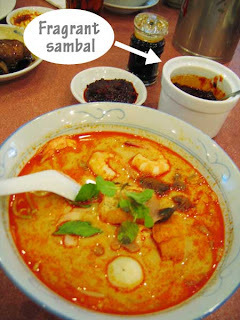 0_0 I really enjoyed the sambal provided. Very fragrant with hints of “burnt” smell. It gave the curry the extra oomph. I almost emptied the whole pot (small pot only la). My cendol came drizzled with thick palm sugar and creamy coconut milk. The cendol stripes were smooth and glides down the throat. Very refreshing and it left me longing for more. 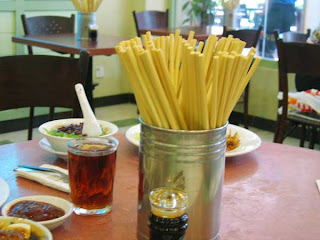 Verdict: Decent Penang-style hawker food with cafe-like prices.